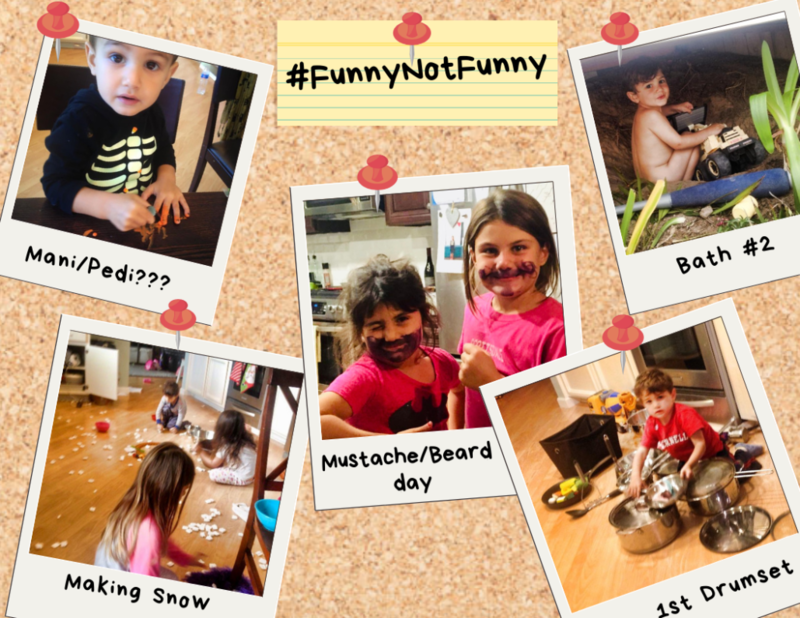 If my life had a hashtag, FunnyNotFunny is probably a tie for first place with FindTheJoy. Motherhood is overflowing with moments that would win the grand prize on America’s Funniest Home Videos .. their bread and butter the t-ball to the crotch … Funnynotfunny, moments. If you can laugh at the moments that may not seem funny at the time, you will definitely bring a lot more joy to your life. I remember learning this lesson quite early in motherhood. We were living with my parents (because trying to buy a house in so-cal, omg) and I was giving Yianna a bath. She was maybe 3 or 4 weeks old. I was in the peak moments of that new-baby-high wearing off and the holy-crap-I-haven’t-slept-for-more-than-45-min-straight-in-four-weeks delirium setting in. I was so tired. Almost everything still made me cry. But I was excited to give her a bath. I filled her little bathtub in the sink with perfectly warm water, had the best baby soap (I’m sure I washed kid #3 with dish soap at some point), and I had a new fluffy towel ready. As soon as I got her undressed and was holding her, she had a giant runny poop all down my chest. Ok, don’t cry, it will be fine. I quickly set her down, wiped her, and took off my shirt. Then I’m holding her in my nursing bra, and SHE POOPS AGAIN! Are you kidding me?!?!? With no shirt to absorb anything, it went all down my chest and stomach and onto the floor. I had two choices: laugh or cry. Well, I laughed until I cried. Funnynotfunny. I stood there hoping my parents wouldn’t come home in that moment as I’m basically naked in their kitchen, and I finished giving her a bath laughcrying. I decided in that moment I didn’t give a shi*t and wrapped her up and just sat in on the couch snuggling her. I had nothing else to do in that moment. Even if it took me an hour to get through that bath, it was okay. The confident efficient days of my life were over, at least for a time. Some things, like when and where my baby pooped, were no longer under my control, and I had to be okay with that and be able to laugh. I just talked to a mama who was in for her 6 week post partum visit for her third baby. We were talking about the toddlers adjusting to baby and she was telling me how the other day, her toddler was proudly displaying her knowledge of body parts and pointed to baby’s mouth saying “mouth! !” but baby opened his mouth at exactly that time and the toddler poked so far back, it hit the end of his throat and he projectile vomited everywhere, Exorcist style. She had just nursed him. “It’s cool, I’ll clean up puke that went everywhere including on the toddler, and then nurse the baby again.” Funnynotfunny. You have to be able to laugh in these moments. I hope you can take that deep breath and stop to find the humor when it feels like life is kicking you in the crotch. Looking back, it’s pretty hilarious that my girls took black sharpies to their faces at 7am for “mustache/beard day at school” when they realized I didn’t go buy the stick on kind. (Yes I sent them to school like this). Or that time I just gave George a bath and then couldn’t find him … after frantically searching, I found him UNDER the tree house, sitting in the MUD playing with his dump truck and baseball bat. Funnynotfunny. I guess he wanted two baths that day. Or the time he took every single pot and pan out of the cabinet to make a drum set, or painted his nails – and the table – bright orange when I took two seconds to go pee, or when all three kids emptied out an entire box of packing peanuts so that it would snow in the kitchen and then started making recipes and cooking with their snow. They say laughter is the best medicine; since becoming a mom, finding the humor has definitely been my saving grace. Find the humor and you will find the joy. I wish you all of the joy.